Rheumatoid arthritis (RA) synovial fibroblasts (SFs) are relatively resistant to apoptosis and exhibit dysregulated growth secondary to production of autocrine-acting growth factors and the accumulation of cell-autonomous defects. Many of the cytokines and growth factors expressed during RA synovitis, including IL-6, epidermal growth factor (EGF), and platelet-derived growth factor, activate the transcription factor Stat3 that has been implicated in promoting cell growth and survival. We analyzed the role of Stat3 in mediating the abnormal growth and survival properties of RA synoviocytes using retroviral-mediated gene transfer of a dominant negative mutant of Stat3, termed Stat3-YF. Approximately 3- to 5-fold overexpression of Stat3-YF effectively blocked endogenous Stat3 activation and Stat3-dependent gene expression, including expression of the socs3 and myc genes. Stat3-YF-transduced RA synoviocytes failed to grow in culture, exhibited markedly diminished [3H]thymidine incorporation (>90% decreased), and died spontaneously. Cell death occurred by apoptosis, as confirmed by annexin V staining, propidium iodide exclusion, and identification of cells with subdiploid levels of DNA. In marked contrast to control cells, EGF accelerated death of Stat3-YF-transduced SFs, such that >90% of cells were dead within 24–48 h of transduction. These results indicate that ablation of Stat3 function converts EGF from a growth/survival factor for RA synoviocytes to a death factor. Stat3-YF also induced apoptosis in osteoarthritis synoviocytes, and levels of apoptosis were increased by exogenous EGF. Apoptosis in Stat3-YF-transduced osteoarthritis synoviocytes was suppressed when Stat1 activity was blocked using a dominant negative Stat1 mutant. Our results identify Stat3 as an important molecule for RA SF survival, and suggest that Stat3 may represent a good target for gene therapy. Rheumatoid arthritis (RA)3 is an inflammatory disease affecting predominantly the joints and is characterized by inflammatory cell infiltrates and hyperplasia of fibroblasts that make up the synovial (joint) lining (reviewed in Refs. 1 and 2). Although joint inflammation with associated tenderness and swelling contributes to the morbidity of RA, an important cause of long-term disability is the destruction of cartilage and periarticular bone (3). Cartilage is destroyed in RA by direct invasion of pannus, an inflammatory mass composed predominantly of macrophages and fibroblasts that secrete proteases and enzymes that degrade surrounding matrix and cartilage. Many studies have suggested that synovial fibroblasts (SFs) play a major role in cartilage destruction, and thus play a major role in the pathogenesis of RA (4, 5). SFs also contribute to RA pathogenesis by producing cytokines, chemokines, and angiogenic factors. RA SFs manifest an abnormal phenotype characterized by increased proliferation, resistance to apoptosis, and invasiveness of adjacent tissues, and have been compared with cells that make up a benign tumor. Abnormalities in RA SF phenotype may occur, at least in part, secondary to an autoimmune reaction, but several lines of evidence suggest that SFs also exhibit cell-autonomous defects that contribute to pathogenesis (6). First, isolated purified RA SFs have a high proliferative potential, form colonies in soft agar, and maintain cartilage-invasive properties in vitro (7). Second, RA fibroblasts are relatively resistant to induction of apoptosis by several pathways, including via the Fas receptor (8). Third, RA fibroblasts continuously produce epidermal growth factor (EGF) and platelet-derived growth factor (PDGF) over several months of culture, and these act as autocrine factors (9). Fourth, RA SFs overexpress the ErbB2/HER2 member of the EGF receptor family relative to normal fibroblasts, similar to ErbB2 overexpression in breast carcinoma cells (10). Fifth, RA SFs accumulate mutations in the p53 tumor suppressor gene and the ras oncogene (11). These mutations are proposed to occur secondary to long-term exposure to reactive oxygen intermediates, and to contribute to the invasive phenotype and hyperplasia of SFs. Sixth, RA (but not control) SFs implanted into SCID mice together with cartilage (in the near absence of any additional cell types) are able to degrade cartilage over the subsequent several weeks to months (12). These points suggest that growth abnormalities of SFs play a role in RA pathogenesis, and this has been confirmed by the finding that forced overexpression of the p16INK4a inhibitor of the cell cycle and subsequent inhibition of SF growth was effective in suppressing inflammatory arthritis in a rat model (13). The Janus kinase (Jak)-STAT signal transduction pathway is used by many cytokines and growth factors that regulate gene expression and cellular activation, proliferation, and differentiation (reviewed in Refs. 14 and 15). The binding of these cytokines to their receptors activates Jaks, protein tyrosine kinases that are physically associated with the receptor. Jaks are required for tyrosine phosphorylation and activation of latent cytoplasmic transcription factors termed STATs. STATs are rapidly tyrosine-phosphorylated after stimulation with cytokines, and subsequently dimerize and translocate to the nucleus, where they can activate transcription. Of seven known STAT proteins, Stat3 has been shown to be active in synovial lining cells in adjuvant arthritis and RA, and in freshly isolated RA SFs (16, 17). Stat3 is activated by a number of cytokines and growth factors expressed in RA synovitis, including IL-6, oncostatin M (OsM), EGF, and PDGF. Stat3 has been strongly implicated in promoting cell survival and growth in many cell types, and contributes to cellular transformation (18). The underlying mechanisms described so far include conferring resistance to apoptosis, transcriptional activation of genes important in cell cycle progression such as cyclins, and activation of expression of protooncogenes such as myc or pim-1 (19, 20, 21, 22). We have examined the role of Stat3 in RA SF growth and survival using retroviral-mediated transduction of dominant negative Stat3. Synovial tissues were obtained perioperatively from patients who fulfilled the revised American College of Rheumatology criteria for definite RA or osteoarthritis (OA) and were undergoing total joint replacement; the protocol was approved by the Institutional Review Board of the Hospital for Special Surgery. Synovial cells were obtained by finely mincing freshly isolated synovial tissue followed by treatment with collagenase A (1 mg/ml; Boehringer Mannheim, Indianapolis, IN) for 2 h at 37°C. Fibroblasts were obtained by allowing cells to adhere to tissue culture plates, followed by removal of nonadherent cells. Similar to previous reports, most of the experiments were performed using SFs after the third passage in tissue culture. At this time, there were <2% contaminating lymphocytes, NK cells, or macrophages, as assessed by flow cytometry and staining with Abs against CD3, CD14, CD16, and CD19 as previously described (23). SFs were cultured in DMEM supplemented with 10% FBS, and cells were routinely split and replated the day before an experiment. Experiments were performed using third passage SFs derived from 11 different patients. Wild-type Stat3 and Stat3-YF and Stat1-YF dominant negative mutants containing a C-terminal FLAG tag (20) were subcloned into the SFG retroviral vector (24) as a translational fusion with the initiator methionine of the viral envelope protein. Recombinant retroviral particles pseudotyped to express the gibbon-ape leukemia virus envelope were produced using transient transfection of SFG plasmids into the 293-GPG2 (H29) packaging cell line (25), followed by cross-infection of the PG13 cells (26) to obtain stable producer cell lines. PG13 producer cell lines were subcloned to identify cells that produced titers of 1–2 × 106 retroviral particles/ml. RA SFs were transduced by continuous exposure to retroviral particle-containing supernatants over the course of 3 days in the presence of 8 μg/ml polybrene, as described (27). Cell lysates were fractionated on 7.5% SDS-polyacrylamide gels, transferred to polyvinylidene difluoride membranes, and incubated with phospho-Tyr-specific Stat1 and Stat3 Abs (NEB, Beverly, MA) or monoclonal FLAG and Stat1 Abs (Transduction Laboratories, Lexington, KY). ECL was used for detection. Total cellular RNA was isolated using TRIzol (Life Technologies, Gaithersburg, MD) according to the instructions of the manufacturer. RNA was treated with RNase-free DNase, and cDNA was obtained using Moloney murine leukemia virus reverse transcriptase (Life Technologies). A total of 2.5% of each cDNA was subjected to 22–25 cycles of PCR using conditions that result in a single specific amplification product of the correct size, as previously described (23, 28): 30 s denaturation at 94°C, 1 min annealing at 55°C, and 30 s extension at 72°C in a GeneAmp 9600 thermal cycler (PerkinElmer, Norwalk, CT). dNTPs were used at 100 μM, and 1 μCi of [α-32P]dATP was added to each reaction. No amplification products were obtained when reverse transcriptase was omitted, indicating the absence of contaminating genomic DNA. Amplification was empirically determined to be in the linear range. Apoptotic cells were detected using annexin V staining, propidium iodide (PI) staining, and analysis of cellular DNA content using flow cytometry, as previously described (23, 28), and cell counts were performed in duplicate using trypan blue exclusion to identify viable cells. For proliferation assays, 5 × 103 cells in 100 μl of medium were seeded in triplicate in 96-well tissue culture plates and cells were pulsed for the final 16 h of culture with 25 μCi/ml of [3H]thymidine and harvested using an automated cell harvester (Harvester 96; Tomtec, Orange, CT), and [3H]thymidine incorporation was quantitated using a Wallac Microbeta Trilux scintillation counter (Wallac, Gaithersburg, MD). RA SFs after the third passage were transduced with retroviruses encoding enhanced green fluorescence protein (eGFP) or wild-type Stat3 (controls) or Stat3-YF (dominant negative mutant) containing a C-terminal FLAG tag. When Stat3-encoding retroviral particles were used, infection rates of 30–50% were obtained (Fig. 1⇓A, left panel; 1 representative experiment of 11 performed is shown). Although eGFP expression was relatively low, secondary to expression from the 3′ position in a bicistronic transcript, the GFP signal was sufficient to monitor transduction efficiency and to purify cells by FACS sorting. Indeed, nearly pure transduced cells were obtained after sorting for cells that expressed GFP (Fig. 1⇓A, right panel). These synoviocytes expressed exogenous Stat3 encoded by the transgene, as assessed by immunoblotting with Abs against the FLAG tag (Fig. 1⇓B, left panel) and Stat3 (Fig. 1⇓B, right panel). Approximately 3- to 5-fold overexpression of STAT proteins was typically achieved. These results demonstrate successful and relatively high efficiency gene transfer into RA SFs. Transduction of primary SFs with Stat3. Third passage RA synoviocytes were transduced with gibbon-ape leukemia virus-pseudotyped recombinant retroviral particles as described in Materials and Methods. Transduced synoviocytes were replated and then analyzed 1 day later using flow cytometry; a fraction of cells was used to make cell extracts. A, Retroviruses expressing a bicistronic transcript with FLAG-Stat3 in the 5′ position and eGFP 3′ to the IRES sequence were used. A total of 41% of RA synoviocytes were successfully transduced (left panel), and cell sorting was used to obtain nearly pure transduced cells (right panel). B, RA synoviocytes transduced with WT or mutant (YF) Stat3 were analyzed for expression of the FLAG-Stat3 transgene using immunoblotting. The capacity of Stat3-YF to act as a dominant negative mutation in our system was tested by analyzing the effects of Stat3-YF on activation of endogenous Stat3 and on the activation of Stat3-inducible genes. Transduced synoviocytes were purified by FACS sorting, and stimulated with OsM, a strong activator of Stat3 and Stat1 in these cells (29). Compared with the eGFP-transduced control cells, cells transduced with Stat3-YF showed suppressed levels of tyrosine phosphorylation of Stat3 (Fig. 2⇓A, top panel). In contrast to Stat3, similar and possibly slightly higher levels of Stat1 tyrosine phosphorylation were detected in OsM-treated Stat3-YF-transduced cells (Fig. 2⇓A, second panel). mRNA was prepared from transduced synoviocytes, and analyzed for the effects of Stat3 transgenes on cytokine induction of suppressor of cytokine signaling (SOCS) 3 expression, which is believed to be regulated by Stat3 (30). 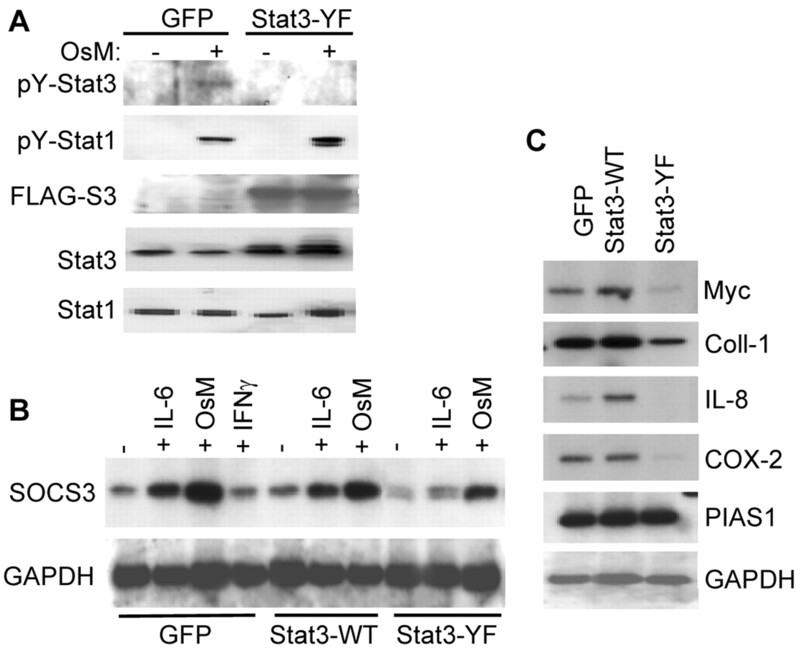 IL-6 and OsM, which activate both Stat3 and Stat1, induced SOCS3 expression (lanes 2 and 3), but IFN-γ, which activates only Stat1, did not (lane 4). Overexpression of Stat3-WT had minimal effect on the induction of SOCS3 expression (lanes 6 and 7), suggesting that endogenous Stat3 is expressed at saturating levels, at least for cytokine-inducible expression of SOCS3. In contrast, Stat3-YF significantly suppressed induction of SOCS3 expression by IL-6 and OsM (lanes 9 and 10, compare to lanes 2 and 3), indicating that sufficient expression of Stat3-YF relative to endogenous Stat3 was achieved to see a dominant negative effect on gene expression. Basal levels of SOCS3 mRNA were consistently detected (Fig. 2⇓B, lane 1), consistent with a previous report (17). Basal SOCS3 mRNA levels were not affected by overexpression of Stat3-WT (lane 5), but were suppressed by Stat3-YF (lane 8). This result is consistent with Stat3-YF-dependent suppression of low level basal Stat3 activity (likely secondary to autocrine action of endogenously produced EGF and PDGF) that was detected in some experiments (data not shown), similar to previously reported basal Stat3 activity in RA SFs (16, 17). The effect of Stat3-YF on basal expression of several other genes was assessed. Interestingly, Stat3-YF, but not Stat3-WT, suppressed expression of Myc, collagenase-1, IL-8, and COX-2 (Fig. 2⇓C); it is not yet clear which genes are suppressed directly at the promoter level and which genes are suppressed by indirect mechanisms. Levels of PIAS1 and GAPDH mRNA were not affected by either Stat3-WT or Stat3-YF (Fig. 2⇓C). In two experiments using OA SFs (see Fig. 6⇓) and one experiment using RA SFs, the effects of Stat3-YF on TNF-α-induced IL-6 production were examined. TNF-α-induced IL-6 production diminished in Stat3-YF-transduced cells relative to eGFP-transduced cells by 30, 30, and 50% in experiments where nearly all Stat3-YF-transduced SFs died by the end of the overnight culture when supernatants were collected (data not shown; see Fig. 6⇓ for cell survival results). When the decrease in cell viability is taken into account, these results suggest that Stat3-YF was not effective in inhibiting TNF-α induction of cytokine production. Taken together, these results indicate that: 1) Stat3-YF has a dominant negative effect in our system; 2) Stat3-YF interfered with a basal signal in these cells, most likely low level Stat3 activity (17) that was not consistently detected by the assays used. Dominant negative effect of Stat3-YF. Sorted transduced synoviocytes were treated with IL-6 (50 ng/ml) + soluble IL-6Rα chain (100 ng/ml), OsM (100 ng/ml), or IFN-γ (100 U/ml). A, Cell extracts were prepared 10 min after cytokine stimulation and analyzed by immunoblotting. B, RNA was prepared 3 h after cytokine stimulation and analyzed using semiquantitative RT-PCR. C, RNA was prepared from unstimulated cells 24 h after transduction and analyzed using semiquantitative RT-PCR. When transduced cells were grown in culture, it became readily apparent just from visual inspection that Stat3-YF-transduced cells did not expand, and cell numbers actually decreased over time (Fig. 3⇓; a representative experiment of eight experiments performed is shown). Therefore, levels of apoptotic cell death and proliferation were analyzed. Apoptosis was assessed directly using flow cytometry and staining with annexin V (which detects early apoptotic cells) (Fig. 4⇓A) and exclusion of PI (a marker for late apoptotic or necrotic cells) (Fig. 4⇓B). Higher levels of apoptosis and cell death were apparent in Stat3-YF-transduced cells relative to control eGFP-transduced cells already after 1 day of culture (Fig. 4⇓, A and B). Fig. 4⇓ shows one representative experiment of seven where apoptosis of Stat3-YF-transduced cells was analyzed using annexin V and PI staining. Statistical analysis of the differences in levels of apoptosis in all seven experiments using ANOVA revealed that the increased apoptosis in Stat3-YF-transduced cells was significant (eGFP vs Stat3-YF, p = 0.05 for annexin V staining and p = 0.007 for PI staining). 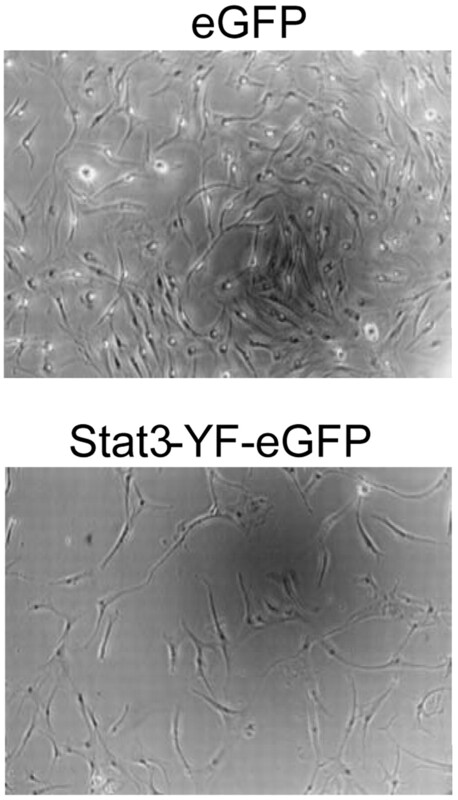 In these experiments, wild-type Stat3-transduced cells could not be used as an additional control, as these cells assumed an aberrant, enlarged morphology; additional controls using Stat1-YF were similar to the eGFP-transduced cells (data not shown). [3H]thymidine incorporation assays were used to assess the effects of Stat3-YF on cell proliferation. [3H]thymidine incorporation in Stat3-YF-transduced cells was appreciably lower than in control cells after 2 days of culture, and the difference was dramatic after 5 days of culture (Fig. 4⇓C; one representative experiment of seven is shown). Because decreased [3H]thymidine incorporation in this system was likely secondary to increased cell death, and possibly inhibition of proliferation as well, the effects of Stat3-YF on progression of RA SFs through the cell cycle were determined. Expression of Stat3-YF for 3 days of culture resulted in a decrease in the fraction of cells in the S and G2/M phases of the cell cycle from 26 to 16%, and in an increase in numbers of apoptotic cells that contain subdiploid levels of genomic DNA, from 8 to 50% (Fig. 4⇓D). These results further support the conclusion that Stat3-YF induces apoptosis, and suggest that Stat3-YF may induce growth arrest as well. The increased levels of cell death in Stat3-YF-transduced cells had a striking effect on recovery of viable cells from these cultures (Fig. 4⇓E). In contrast to control cells that expanded in culture, the number of viable Stat3-YF-transduced cells did not increase, and actually decreased, such that there were very few viable cells after 4 days of culture (Fig. 4⇓E). IL-6 suppressed expansion of control cells (Fig. 4⇓E) similar to previous reports (29, 31). The basis for this effect is not understood, but may be secondary to strong activation of Stat1 at the dose of IL-6 used (see Discussion). IL-6 did not reverse induction of apoptosis by Stat3-YF-transduced cells (Fig. 4⇓E). A suppressive effect of Stat3-YF on cell expansion has been observed in eight of eight experiments with RA SFs performed to date, suggesting that Stat3-YF blocks an important constitutive growth/survival pathway. Decreased growth of Stat3-YF-transduced SFs. Control eGFP- and Stat3-YF-transduced RA SFs were cultured in complete medium, and photomicrographs were obtained. One representative experiment of eight performed is shown. Stat3-YF induces apoptosis in RA synoviocytes. Transduced cells or GFP+ cells that had been sorted immediately posttransduction were analyzed after several different time points in culture, and representative results are shown. A and B, Cells were analyzed by two-color flow cytometry for GFP expression (x-axis, transduced cells) and annexin V staining (early apoptosis) or PI uptake (cell death) on the y-axis. The percentage of GFP+, transduced cells that stained positive is shown in the upper right panel. C, Sorted cells were plated in triplicate, and thymidine incorporation (16-h pulse before harvesting) was used to measure cell proliferation. D, Cellular DNA content was determined after 3 days of culture. E, Cell counts on duplicate wells using trypan blue exclusion to identify viable cells were performed after 4 days of culture of sorted cells. EGF is a growth factor for many cell types, but has pleiotropic effects and, in certain cells, may contribute to growth arrest or apoptosis by a mechanism that is dependent on Stat1 (32). EGF is a major growth and survival factor for RA synoviocytes, and acts, at least in part, via the ErbB2 receptor that is overexpressed on these cells (10). Control and Stat3-YF-transduced RA synoviocytes were cultured for 1–6 days with or without exogenous EGF, and cell growth and survival were evaluated. Consistent with the results in Fig. 4⇑, after 2 days of culture fewer viable cells were recovered from wells containing cells transduced with Stat3-YF (Fig. 5⇓A), even in the absence of any added factors. Addition of exogenous EGF to control internal ribosomal entry site (IRES)-eGFP-transduced RA synoviocytes resulted in an increased number of viable cells (Fig. 5⇓A). In marked contrast, EGF treatment had the opposite effect on Stat3-YF-transduced cells, namely, a greater decrease in viable cells (Fig. 5⇓A; one representative experiment of five performed is shown). Consistent with the cell counts, EGF-treated Stat3-YF-transduced cells exhibited markedly lower [3H]thymidine incorporation than EGF-treated control cells (Fig. 5⇓B). EGF suppressed background apoptosis levels to very low levels in control IRES-eGFP-transduced cells (Fig. 5⇓C, left panel), but did not suppress, and actually increased apoptosis levels in Stat3-YF-transduced cells (Fig. 5⇓C, right panel, and data not shown). Induction of increased cell death by EGF was consistently detected in five of five experiments in which EGF was used and the differences were statistically significant (−EGF vs +EGF, p = 0.003 for annexin V staining and p = 0.05 for PI staining). These results indicate that ablation of Stat3 function converts EGF from a growth/survival factor for RA synoviocytes to a death factor. The most plausible basis for this effect is that endogenous wild-type Stat3 opposes proapoptotic signals from the EGFR/ErbB2, and these signals are unmasked and act unopposed when Stat3 is not functional. The acceleration of cell death by exogenous EGF suggests that the increased apoptosis observed in Stat3-YF-transduced cells in the absence of exogenous factors (Fig. 4⇑) may be secondary to the unbalanced action of autocrine growth factors, PDGF and EGF, that are produced by these cells. EGF induces death in Stat3-YF-transduced cells. Transduced cells or GFP+ cells that had been sorted immediately posttransduction were analyzed after several different time points in culture, and representative results are shown. A, Cell counts of duplicate wells using trypan blue exclusion to identify viable cells were performed after 2 days of culture of sorted cells. EGF was used at 100 ng/ml. B, Sorted cells were plated in triplicate and thymidine incorporation (16 h pulse before harvesting) was used to measure cell proliferation. C, Cells were analyzed by two-color flow cytometry for GFP expression (x-axis, transduced cells) and PI uptake (cell death) on the y-axis after 3 days of culture with EGF. The percentage of GFP+, transduced cells that stained positive is shown in the upper right panel. We wished to determine whether Stat3 is also required for survival of OA SFs. OA SFs from three different patients were transduced to express eGFP or dominant negative Stat3-YF, and cells were analyzed 1 day later by annexin V and PI staining. 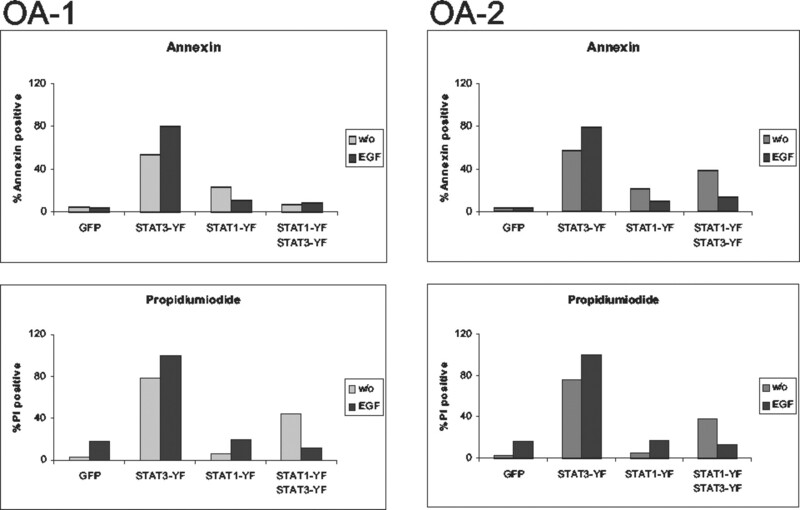 Similar to RA SFs, Stat3-YF induced increased apoptosis in OA SFs (Fig. 6⇓; two experiments using OA SFs are shown). The increased apoptosis induced by Stat3-YF was statistically significant (eGFP vs Stat3, p = 0.03 for annexin V staining and p = 0.009 for PI staining). Addition of EGF to cells transduced to express Stat3-YF resulted in a higher level of apoptosis (−EGF vs +EGF, p = 0.05 for annexin V staining and p = 0.04 for PI staining). One potential mechanism for increased apoptosis in cells expressing Stat3-YF is unopposed activation of Stat1, which has proapoptotic properties, by synoviocyte-derived factors or exogenous EGF. The role of Stat1 in synoviocyte apoptosis was tested by first transducing SFs with dominant negative Stat1-YF, sorting to obtain transduced cells, followed by a second transduction with Stat3-YF. In the absence of EGF, expression of Stat1-YF resulted in a modest but significant decrease in PI positive Stat3-YF-transduced cells (p = 0.03); annexin V positive cells also decreased, but to a variable extent and the difference was not statistically significant (p = 0.2). When exogenous EGF was added, Stat1-YF effectively blocked apoptosis in Stat3-YF-transduced cells (−EGF vs + EGF, p = 0.03 for annexin V staining and p = 0.03 for PI staining). These results suggest that one mechanism by which Stat3 promotes survival of SFs is by opposing the action of Stat1. When we examined the role of Stat1 in apoptosis of RA SFs transduced with Stat3-YF, a pilot experiment showed a weak and partial effect (data not shown). Additional experiments will be required to assess whether differences between OA and RA SFs are significant, and whether any differences may be related to higher EGF receptor expression in RA SFs. Stat3-YF induces apoptosis in OA SFs, and induction of apoptosis is blocked by dominant negative Stat1-YF. OA SFs were transduced with Stat1-YF, and subsequently control or Stat1-YF-expressing cells were transduced with eGFP, Stat3-YF, or Stat1-YF. After overnight culture without or with EGF (100 ng/ml), SFs were analyzed using annexin V and PI staining and flow cytometry. In this report, we present data that Stat3 is important for the survival and expansion of growth factor-dependent SFs that are important in the pathogenesis of RA. Importantly, ablation of Stat3 function led to accelerated cell death in response to growth factors such as EGF. These results extend our knowledge of the role of Stat3 in growth regulation to a cell type that is important in arthritis and manifests certain aspects of cellular transformation. Dominant negative Stat3-YF also induced apoptosis in OA SFs, thus identifying primary SFs as a cell type that is dependent upon Stat3 for survival. Interestingly, the partial transformation of synoviocytes that occurs during RA and makes them resistant to induction of apoptosis by other pathways did not abrogate their dependence upon Stat3 for survival. The major emphasis in RA cytokine research focuses on targeting pathways activated by cytokines related to TNF and IL-1, and the downstream signaling pathways mediated by NF-κB and AP-1 transcription factors (33). The role of the Jak-STAT pathway in inflammatory arthritis has not been extensively investigated. Our results, together with data that Stat3 is active during inflammatory arthritis (16, 17), suggest that Stat3 represents a promising novel therapeutic target in RA. It may also be useful to target ligands for receptors that activate Stat3, or other components of the Jak-STAT signaling pathway. The notion that Stat3 and related Jak-STAT signaling proteins may play an important role in the pathogenesis of several inflammatory diseases is supported by recent reports showing that overexpression of wild-type SOCS3 (also known as CIS3), an inhibitor of Jak-STAT signaling and Stat3 activation, suppressed experimental arthritis, and a dominant negative SOCS3/CIS3 mutant potentiated inflammatory bowel disease in murine models (17, 34). A substantial amount of evidence has accumulated supporting a role for Stat3 in cellular transformation and oncogenesis. Stat3 can be activated by oncogenic kinases such as v-Src, and in several tumor models or transformed cell lines, a causal role for Stat3 in driving abnormal growth has been proposed (18, 35, 36, 37). The mechanisms by which Stat3 contributes to oncogenesis include increasing expression of antiapoptotic Bcl family proteins, proteins important for the cell cycle, protooncogenes such as myc and pim-1 (22), and suppressing cell surface Fas expression (38). In primary cells where oncogenic pathways are not activated, the role of Stat3 is more complex, as Stat3 promotes survival of T cells, but suppresses the proliferation of myeloid precursors, promotes the apoptosis of mammary epithelial cells, and in keratinocytes, has a more prominent role in regulating cell migration than cell survival or growth. We have shown that in primary SFs that have abnormal growth properties but remain growth factor-dependent, Stat3 is an important survival factor. The mechanisms by which Stat3 contributes to survival in RA SFs have not yet been fully elucidated, but the data suggest that Stat3 works, at least in part, by maintaining myc expression (Fig. 2⇑), and by opposing a proapoptotic signal delivered by EGF, and possibly other factors. 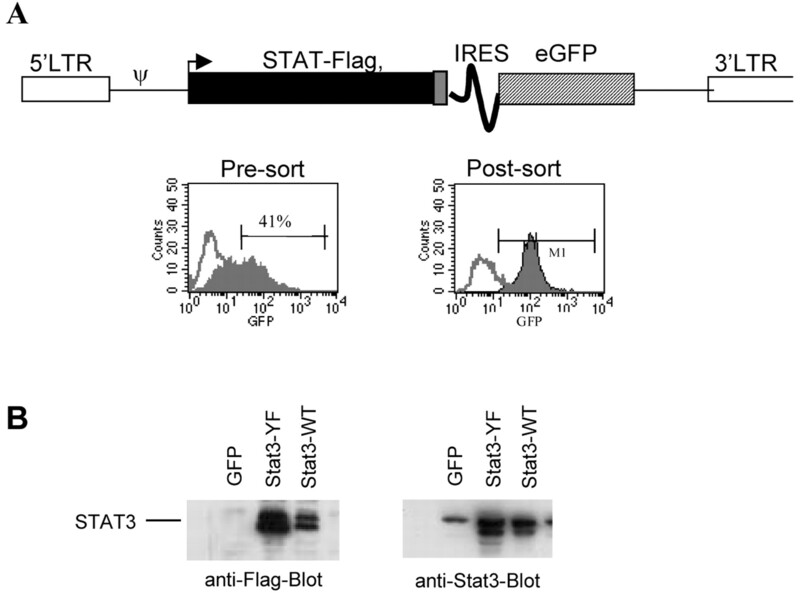 In OA SFs cultured in the presence of EGF, an important mechanism by which Stat3 promotes cell survival is by opposing the proapoptotic effects of Stat1, as Stat3-YF-induced apoptosis was almost completely abrogated when Stat1 function was suppressed (Fig. 6⇑). This scenario presents an interesting analogy to signaling by cytokines such as TNF, where activation of NF-κB serves to oppose simultaneously activated death pathways (39). Antagonism of Stat1 proapoptotic effects by Stat3 have recently been convincingly demonstrated (40), and unbalanced activation of Stat1 by EGF that leads to apoptosis is consistent with the emerging data demonstrating that Stat1 and Stat3 can serve as, respectively, a tumor suppressor and a tumor promoter (18, 41). A pilot experiment indicated that unopposed Stat1 activity may play less of a role in Stat3-YF-induced apoptosis in RA than in OA SFs, suggesting that Stat3 suppresses additional proapoptotic pathways in RA cells. One possibility is that the partial transformation of RA SFs may make them more dependent upon Stat3-inducible genes, such as myc, and this will be resolved in future experiments. One important goal in the therapy of RA is suppression of inflammation. However, suppression of inflammation does not necessarily result in proportionate suppression of tissue destruction (42, 43). Thus, there has been a strong emphasis on developing therapeutic strategies to induce apoptosis of joint macrophages and fibroblasts, thereby ablating the inflammatory pannus. Induction of apoptosis of these cells requires an understanding of the pathways and molecules that promote their survival, and NF-κB, Akt, and sentrin have been previously reported to be important for the survival of RA synoviocytes (44, 45, 46). These molecules serve as targets for novel therapeutic approaches, many of which use gene therapy approaches in murine models of arthritis, and results inhibiting NF-κB have been promising (46). The work presented herein adds Stat3 to the list of therapeutic targets in RA. Stat3 is an attractive therapeutic target, as loss of Stat3 function led to exceptionally effective induction of apoptosis in RA synoviocytes. Another potential advantage of targeting Stat3 is that this approach converts endogenously produced growth factors, such as EGF, into death factors, and thus uses endogenous factors produced during synovitis to more effectively eliminate pathogenic cells. We thank R. Mulligan for providing cell lines, J. Bromberg and J. Darnell for providing plasmids, and S. Ahmed and I. Tassiulas for careful review of the manuscript. We also thank Dr. Margaret Peterson for statistical analysis. ↵1 This work was supported by grants from the National Institutes of Health and American Cancer Society. ↵3 Abbreviations used in this paper: RA, rheumatoid arthritis; SF, synovial fibroblast; eGFP, enhanced green fluorescence protein; SOCS, suppressor of cytokine signaling; PI, propidium iodide; EGF, epidermal growth factor; PDGF, platelet-derived growth factor; Jak, Janus kinase; OsM, oncostatin M; OA, osteoarthritis; IRES, internal ribosomal entry site. Firestein, G. S., and N. J. Zvaifler. 1990. How important are T cells in chronic rheumatoid synovitis? [Published erratum appears in 1990 Arthritis Rheum. 33:1437.]. Arthritis Rheum. 33:768. O’Shea, J. J. 1997. Jaks, STATs, cytokine signal transduction, and immunoregulation: are we there yet? [Published erratum appears in 1997 Immunity 7:444.]. Immunity 7:1.